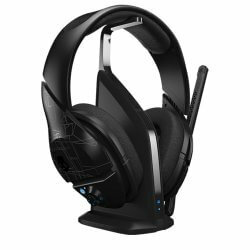 What Should Everyone Know About Wireless Gaming Headsets? Compare the top 8 wireless gaming models in the table above. Additionally, learn what you need to know before getting wireless gaming headphones so you’re not disappointed. Note: Previously named SteelSeries H Wireless but has been renamed to Siberia 800, the headset is exactly the same. The microphone is omnidirectional, it picks up sounds all around you. This isn’t perfect for gaming but does the job nonetheless. SteelSeries Siberia 800 have well-made headphones. The main material is plastics, but durable, high-quality type that doesn’t break easily. 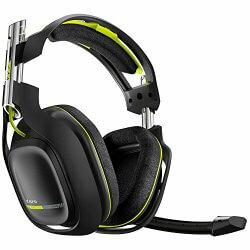 The headset has virtual 7.1 Surround Sound support which helps with positional accuracy and immersive gameplay. It’s not as good as with high-end wired gaming headphones but isn’t bad either. The wireless connection uses 5.8 GHz technology for audio transmission and works up to about 30ft without disconnects or distortion. 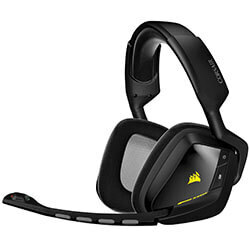 It is comparable to other top-notch wireless gaming headsets. The soundstage with virtual 7.1 Surround Sound is pretty good. It won’t win any rewards but does the job better than most closed-back headsets for gaming. 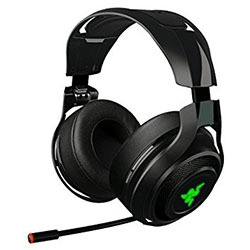 Of course, this wouldn’t be Razer if it didn’t have the 16.8 million light color options on the sides of the headphones. You can decide from many different lighting options, though we find the whole feature pretty useless, especially considering it “consumes” a couple hours of battery power. It seems SteelSeries still makes the best wireless gaming headsets. Their new Arctis 7 model offers a lag-free wireless premium gaming experience at a very reasonable price. A robust frame and comfortable features compliment the overall quality sound and electronic performance, making the Arctis 7 a great choice for a wireless headset. Considering the price, we think you can’t get more for your money. 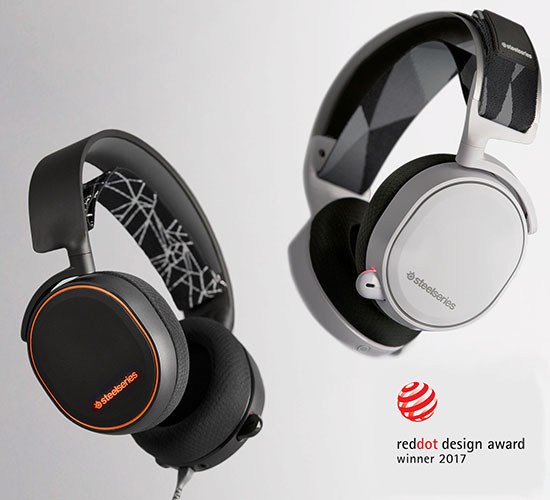 SteelSeries Arctis series won the Red Dot Design Award in 2017. This tells a lot about the quality of this wireless gaming headset. Besides allowing lag-free wireless audio transmission via the included 2.4 GHz USB transceiver, the Arctis 7 features both USB and analog audio cables. Wireless transmission range is good for about 40 feet (12m). The Arctis 7 is compatible with PC, Mac, Xbox One, PlayStation, mobile devices, and VR devices, but you’ll only get analog audio with Xbox One and mobile devices. The 7.1 virtual surround sound feature is only available for Windows users. Additional software is available for game/chat balance and other audio customization features on PC and Mac. SteelSeries uses ClearCast bi-directional mic technology to provide good background noise rejection and quality audio transmission. The retractable boom microphone quickly tucks out of the way when not needed or when traveling. Check out the top Bluetooth earbuds on the market right now. The built-in rechargeable battery will last up to 24-hours on a single charge via the micro USB cable. While the rechargeable battery cannot be quickly swapped out, you can still use the headset while it is charging for uninterrupted gaming. There are two USB ports on the headset, one for charging and one for audio. This may cause a little confusion until you get used to it. SteelSeries wins some good style points with the sleek design of the Arctis 7 wireless gaming headset. This is not a bulky, oversized headset, and the quality in construction materials is evident. Controls are located on the earcups for volume up/down and mic mute, and the red illumination on the boom mic turns off when it is muted. The lightweight steel alloy headband is very durable and more stylish than the typical thick padded plastic headbands found on other headsets. There are several analog cables provided so that you can connect to various devices. A 2-year warranty is provided for EU residents, and a 1-year warranty is provided for all other purchasers. The ski goggle-like headband support is very effective at keeping the steel headband from resting directly on your head, reducing pressure points. The “AirWeave” fabric definitely feels plush and more breathable than vinyl or leather trimmed headsets. Clamping pressure is average, so users with a larger head size may feel some slight pinching around the ears, but it isn’t too bad. The shallow padding around the earcups can allow the plastic driver covers inside the earcup to press against the ears ever so slightly. The Arctis 7 is trimmed with a comfortable and breathable earcup fabric that is suitable for long gaming sessions. 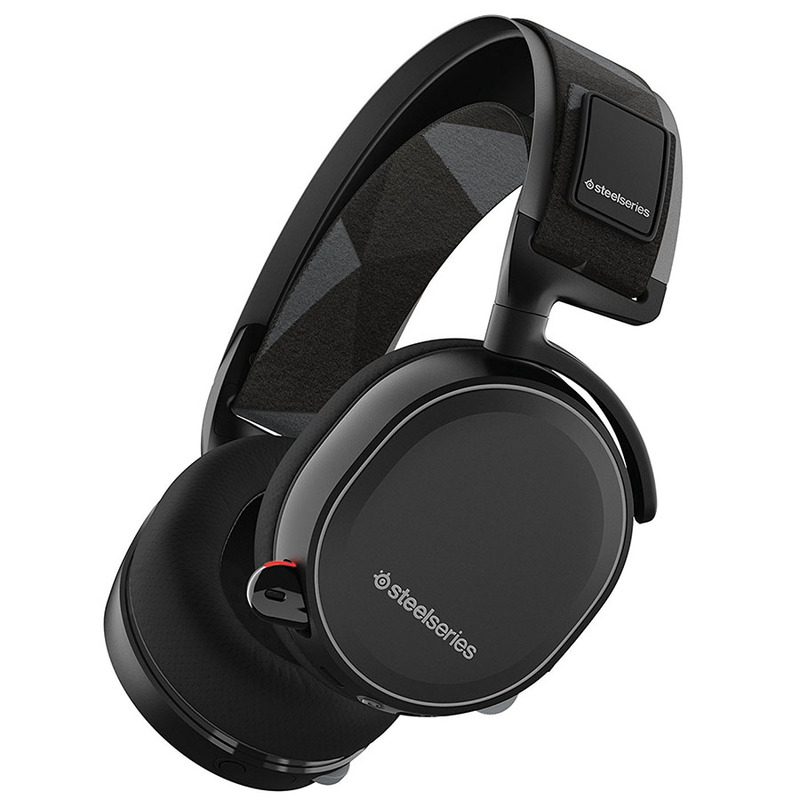 S1 40mm speaker drivers are included with the SteelSeries Arctis 7 wireless headset and they work really well for gaming. The optional SteelSeries Engine 3 software allows you to save audio presets and other custom sound settings. While the Arctis 7 is certainly not an audiophile-quality set of headphones, it does provide a reasonably wide soundstage with decent dynamic range. It should be noted that excessive bass and volume can tend to overload the audio engine in certain genres of music. Voices are very clear and overall frequency balance is respectable. The great thing about the adjustable headband strap is that you can make it tighter to enhance the bass and seal of the earcups around your ears if needed. The SteelSeries Arctis 7 lag-free wireless headset is a winner when it comes to style, build quality, and general comfort. With clear microphone sound, good overall sound quality, and a robust contemporary design, this headset provides the best value for your money right now. The Logitech G533 Wireless DTS 7.1 gaming headset provides a great mix of quality features, comfort, and value. We think this is the best wireless gaming headset under $100 right now. Professional-grade wireless connectivity and customizable audio features allow for a good gaming experience without a premium price tag for a headset. The wireless USB adapter for the Logitech G533 headset is only compatible with PCs running Windows 7.1 or greater. There is no analog audio connectivity option. The wireless connectivity with the USB adapter works great, even in high-density 2.4 GHz band environments. The average wireless audio range is about 50 feet (15m). The compact noise-cancelling boom mic includes an integrated pop filter to help with some of the close-mic plosives (breathing sound) that can be a problem with headset mics. Muting the microphone can be accomplished by either lifting the boom up and out of the way or by pressing the mute button on the side of the headset. The best wireless headphones for kids. 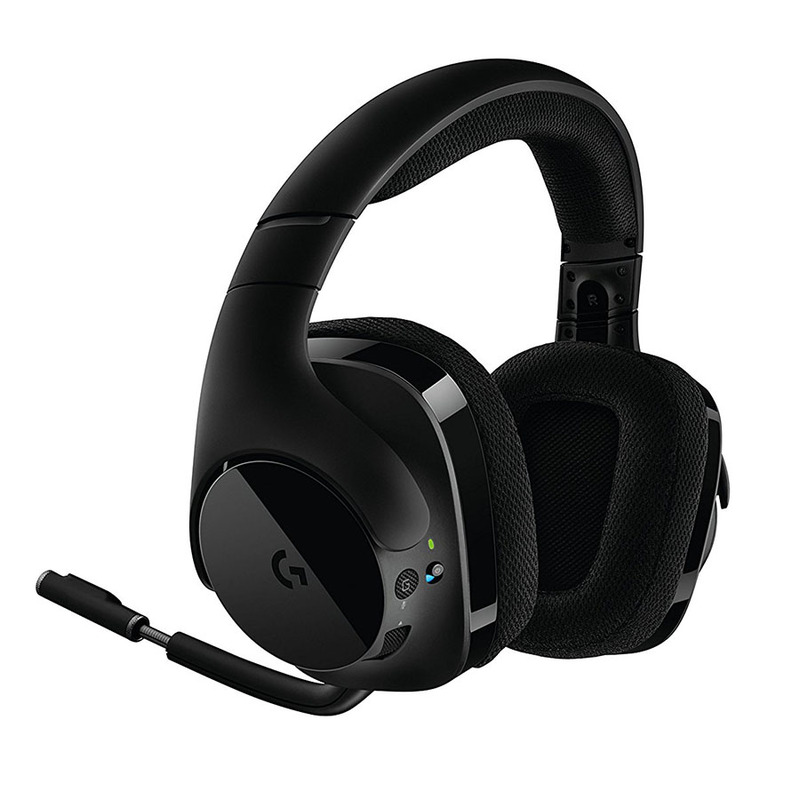 With a 15-hour battery life, you can use the Logitech G533 wireless headset for all of your long gaming sessions. If you are running low on power, you can easily recharge the battery with the included USB cable while still using the headset. The battery is also replaceable if you ever need to swap it out. This gaming headset is slightly more compact and sleek than some other Logitech gaming headsets. The black plastic casing is reasonably attractive, with a bit of high-gloss trim to accent the earcups. Audio controls are included on the earcups, with an additional multi-function button that can be programmed for user-defined controls. The optional Logitech Gaming Software works great for enhancing the EQ settings, engaging the DTS 7.1 surround sound mode, and monitoring the battery life. You can also fine-tune the sound of your own voice volume in the headset with the software and on-set controls. Some users have reported some quality control issues when receiving new headsets, so be sure to test all the functions in your headset when you get it. If you do find any issues with the headset quality, the manufacturer provides a 2-year warranty. The headband and weight distribution of the Logitech G533 wireless headset is well balanced to provide a comfortable fit without being too tight or clamping too hard. Soft earpads and the gentle headband pressure makes this a great headset if you wear glasses. The breathable sports-mesh earcup padding is not super plush, but it is comfortable, plus it has the added benefit of being removed for cleaning. While they don’t feel heavy during extended wearing, the G533 can get a little warm after long gaming sessions. Logitech isn’t known for producing audiophile quality headphones, so the G533 isn’t going to blow you away, but it’s pretty good for a modestly priced headset. Regular users will be happy with the sound quality. ProG drivers deliver an extra-wide soundstage with simulated DTS Headphone:X 7.1 surround sound audio, which is great for rich gaming environments, especially for 1st person games. Both stereo and surround sound listening modes deliver a well-balanced sound that is clear and focused, especially for vocals. The bass can be perceived as a little weak initially, but it is easily fixable and customized with the Logitech Gaming Software. Skullcandy PLYR1 is one of the best wireless headsets for gaming though not perfect. 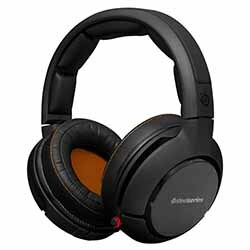 Industrially designed headphones with good sound quality that offer Surround Sound for PC and consoles is hard to find these days. That’s exactly what Skullcandy PLYR1 offer. The microphone is quite sensitive and can pick up unwanted noise if you have it too close to your mouth, but because you can adjust it, it works pretty nice overall. 10 hours of battery life is pretty decent and beats even the popular Astro A50 headset in this department. The bass can be quite strong but can be adjusted with the equalizing presets so you can change it to your liking. 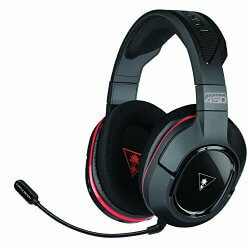 Force Stealth 450 is one of the best cordless gaming headsets at its price. The changes are minimal, probably the biggest one is a slightly improved design with better earpad cushions and detachable microphone. On the other hand, the Ear Force Stealth 450 doesn’t support Bluetooth devices like the old version did. The headset uses a rechargeable battery that on a full charge gives up to 15 hours of play time. This is pretty good and can be compared to the premium $300 gaming headsets. Initially, the fit is very snug, even to the point of discomfort, but after some use, this usually fixes itself as the headband and ear pads accustom to your head size. One of the more “gamer-looking” wireless gaming headsets that don’t disappoint. The new gaming headset improves in some aspect but also costs a bit more money. Compared to other wireless gaming headsets, it’s still very affordable. Keep in mind that you can get wired Corsair VOID headset for less money, but it also has fewer features, so we are only reviewing the wireless model. The plastic design also helps with flexibility and lightweight. Corsair VOID Wireless has a well thought-through design that answers all needs of a gamer. Compared to audiophile headphones, the sound quality is somewhat lacking. The bass is present but doesn’t go very deep, mids and highs lack clarity and detail. Are you a fan of classic Apple-like earbuds? Check these out.